Go beyond merely putting some oil and meat together in a pan, bro! 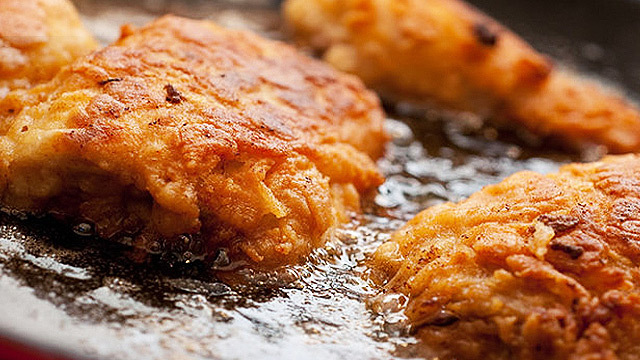 Frying is one of the easiest ways to make food edible, and we believe it's a kitchen skill every man should master. Unfortunately, it's not as simple as merely putting oil and some meat together in a pan and then heating the whole thing up. Sure, the end result will probably still be edible, but it won’t be something your mom would be proud of you for. So, for today, we’re challenging you to get your bum in the kitchen to test out these prito hacks that will make frying easier, and your burnt smoking hot meaty creations (possibly) taste better and healthier! Slice up a big onion, put a couple of its rings on your frying pan, and crack your eggs in them. Behold, perfect eggy discs to rival those of your favorite fast food chain’s! Yep, you read that right: Water. Place your bacon in a pan with water, keep the heat a bit low, and wait patiently until the meat gets perfectly crispy. As a bonus, this method is also nice for de-greasing those sinfully delish strips of pork meat. Click here for a step-by-step guide! Here’s how you can tell if the oil in your pan’s hot enough for frying: If bubbles appear around a wooden chopstick, then you can start dunking your food in. That's it! While regular store-bought breadcrumbs are a kitchen staple, you could try adding some spice to your dish by using other kinds of crumbly goods for that extra crunch. Try potato chips and sesame seeds the next time you make fried chicken! Not only will your food get fried to a nice crisp, this will also help prevent the much-dreaded talsik ng mantika. Frying all your food at once can quickly lower the temperature of your oil, making it counterproductive. Fry just a few pieces at once, making sure that oil is touching all sides of each piece. Remove any debris you find swimming in your oil, from chunks of meat and breadcrumbs to stray gulay. As tiny as these pieces may be, they can still give off a weird flavor to the rest of your food when they get burnt. And if you’re planning to recycle your oil, make sure to strain it first before placing it in your container. If you, like us, are deathly afraid of oil splatters, you could try placing a few pinches of cinnamon in your pan oil right before adding in the meat. Apparently, this spice keeps the oil from splattering. It sure won’t hurt to give it a try! Adding a pinch of baking soda to your food will make it less oily—the bubbles it will produce can reduce the amount of grease your dish absorbs. Rid your fried food of excess oil by placing them on a plate lined with paper towels—you’ll be amazed by how quick the towels will get soggy due to all the extra grease. It’s an easy way to make your food sliiiightly healthier!